He played in Jon Ferrari‘s Dollar Baby In The Deathroom as Fletcher. 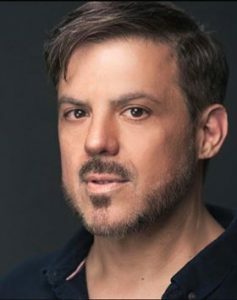 Marco Scapillato: I am an actor/singer out of buffalo, NY. Took a serious step back into acting 2yrs ago, and havent looked back. SKSM: When did you know you wanted to become an actor? Marco Scapillato: I knew I wanted to be an actor when I was 8 years old, no joke. I performed at an impromtu improv challenge at my local park/rec center. I had to pretend I was an old man, so I grabbed something to act as a cain, and channelled my grandpa. Everyone laughed. It worked. I got a reaction. SKSM: How did you become involved in In the Deathroom Dollar Baby film? Marco Scapillato: I became involved with In The Deathroom by knowing Jon actually. He cast me in a different film he was working on that wasn’t ready to start, so he called and asked if I’d play the journalist in Deathroom, and I said yes, the fact that it was a Stephen King story made it easy. Marco Scapillato: The story attracts people because it’s a scenerio that we could all find ourselves in and not see it coming. And how it ends attracted me. Against all odds, how does this guy end up? SKSM: You worked with Jon Ferrari on this film, how was that? Marco Scapillato: Working with Jon was a great experience, no drama. I was able to let go and sink my teeth. I needed to have that and this was me getting on a set and acclamating myself. Marco Scapillato: I lost it and broke into laughter when we were shooting. I had to get it out of my system. I ruined takes, but it was ok.
Marco Scapillato: I am still in contact with Jon. We became tight. I love the guy and I run into other cast mates here and there. Marco Scapillato: Lately I have been busy with acting gigs, thankfully. I just shot three projects back to back. One in rochester, and one here. I also just got back from shooting a project in Atlanta. These are paid gigs with crews. Marco Scapillato: I’m one of three in the world that has not read Stephen King. Im not a big reader but I fantasize about reading his library. I always wonder where to start. I often ask, but I havent begun. Marco Scapillato: People would be surprised to know that I am a realtor.